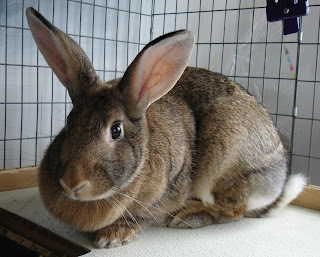 Medfield Animal Shelter News: Pearl the Bunny Finds a Great Home! Pearl was adopted yesterday by the same family that recently adopted Luigi the pet rat. They were kind enough to send us an update this morning letting us know how well she is already doing in their home. I just wanted to let you know that Pearl (now Ingrid, or Inga for short) is doing great. We can definitely tell she is a house bunny! She is so content just hopping around her room checking things out. We kept her in her room last night so she could settle but it’s very clear she’s eager to explore the rest of the house. She briefly met the cats and dogs … they cats are terrified but the dogs are of course very excited will still careful not to get too close. She took it all in stride and did not seem bothered at all, just went on cleaning herself and hopping around. She went to approach one of the cats and they bolted in the other direction. I think she’ll do just fine. She has a great appetite and is especially fond of her greens. Whenever we go in the room she comes hopping over to the door and lays down to be petted. Then she does what we are calling ‘flat bunny’ where she puts her legs out and her ears back and closes her eyes while we’re petting her. Al walked in to her room this morning and she was sprawled out on her side on the carpet. She seems to be very comfortable. She is also very clean. I was very impressed that after an hour long car ride back home she didn’t have an accident in the crate but waited until she could use her litterbox. We love her very much already and promise to take great care of her and spoil her rotten. We’ll take some pictures of both her and Dimitri over the weekend and I’ll send them to you on Monday. Thanks so much for our new baby!!! She is such a sweet girl.